Mac Only. Occasionally, a Picturelife team member will need a more detailed diagnostic log for a Support issue. Below are instructions to enable and complete Verbose Diagnostic Logging. If logging is currently ENABLED, first click Disable Diagnostic Logging. If logging is currently is currently DISABLED, hold down the Option key and click Enable Diagnostic Logging - it's important to hold down Option in order for us to get a verbose log. At this point, follow specific instructions from the Picturelife team member who is helping you. After completing the specific instructions, return to Advanced Preferences and click Disable Diagnostic Logging. 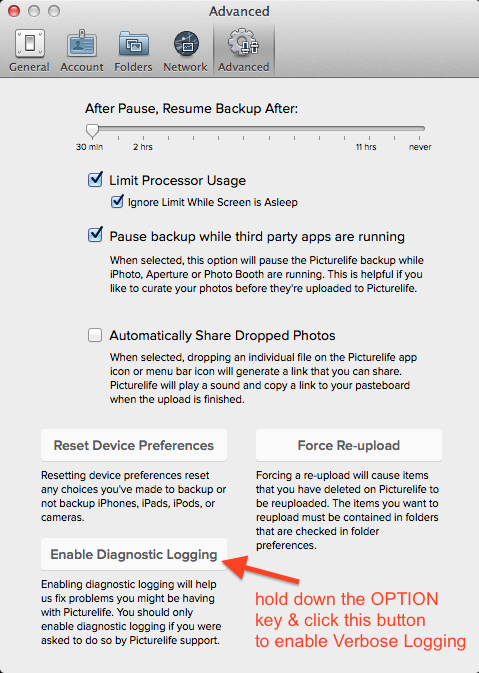 This will generate a log that's saved on your desktop - please attach that file to an email and send it to the Picturelife team member.